Weigand-Omega Management operates in accordance with the Fair Housing Act (The Civil Rights Act of 1968, as amended by the Fair Housing Amendments Act of 1988), as well as all applicable state and local laws regarding fair housing and equal opportunity. Weigand-Omega Management will not knowingly advertise for real estate in any manner that violates the law. All persons are hereby informed that all dwellings advertised on this Web site are available on an equal opportunity basis. Weigand-Omega Management is committed to ensuring that our residents and their guests share equal access to the buildings, amenities, resources, and activities available at our communities to the fullest extent possible. may have particular needs. Weigand-Omega Management will work with our residents to identify things that can be done to make our apartment homes and the amenity areas more accessible or useable by our residents or their guests with disabilities. 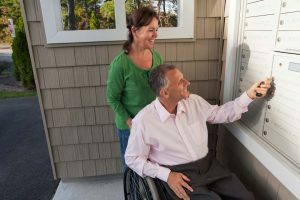 If you or your guest have a disability and you think that an accommodation or modification might enhance access to or enjoyment of your apartment or your apartment community, you may request it any time during your residency. We encourage you to email us at access@weigandomega.com or, if you would prefer, call our corporate line at (316) 263-2215 to let us know how we can better meet your needs.